Hi Cheapo Dies Fans!! Lori here today with a card that I made with the Exclusive Cheapo Dies Cross die. For my card I started with Kraft card stock for the base of the card. I took a piece of Lemoncraft paper, used my tearing ruler to distress the right side of the paper and inked the edges with Tea Dye distress ink and added that to the card. I took a piece of gold glitter paper and cut it out with the Cheapo Dies Cross die and added that to a scrap of blue paper, inked the edges with Tea Dye distress ink and then added it to the card. I stamped the sentiment with black ink onto the bottom of the card. 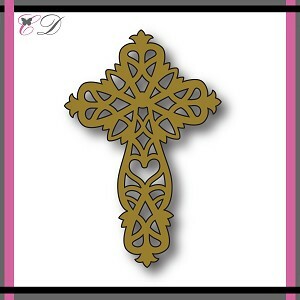 I love the way the gold glitter paper makes the intricate design on the Cross stand out! 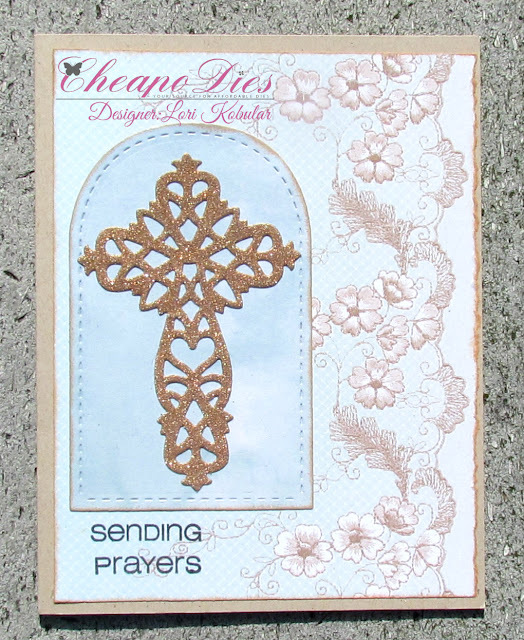 Be sure to stop by the Cheapo Die Blog often to see what the Design Team have created! !